Different rear tire size? Click here. Don't know your tire size? Click here to find it. All same size tires? Click here. Introducing the Falken Azenis RT-615K. Falken's Race-bred, Stick-to-the-Pavement tread compound offers the ultimate in handling and performance. This street-legal racing tire is the NEWEST and HOTTEST tire for Auto-X. Welcome to VulcanTire.com, the Internet Source for Tires. 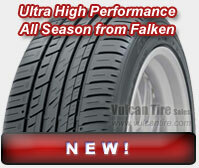 Here at Vulcan Tire Sales we have been selling tires and tire accessories online for over 15 years (since 1997). Our customers enjoy secure shopping, fast shipping, and excellent customer service. We sell major tire brands including Goodyear, Yokohama, Pirelli, Falken, Kumho and Vredestein. Ordering from VulcanTire.com is easy thanks to our proprietary tire shopping database, built from the ground up to sell discount tires, tire chains, TPMS and accessories. CLICK HERE to search for your size! From the designer of the world's most exotic cars comes the world's most exotic tire! 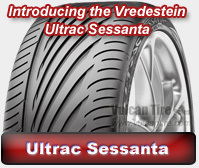 The Vredestein Ultrac Sessanta tire was designed with the help of Giugiaro Design. Giugiaro has aided in the conception of exotic cars including Maserati and Ferrari. LEARN MORE.